Being from the North-West of England, Chris has grown up amongst the fantastic musical diversity in and around Manchester, and is especially interested by the almost lost traditional music of his native region of Lancashire and the North-West in general. Jigs, Slip jigs, Reels, Hornpipes etc, are well know as being part of Irish music, but they are also native to the North-west of England, with which there has always been a lot of common ground in the folk tradition. Whilst staying close to his musical roots, he is very much part of a living tradition and keeps an open mind and attitude towards other musical styles. (percussionist from legendary Breton groups Barzaz, Bleizi ruz, etc) . Click on above photo for enlarged and further pictures. Chris is also well known for his flute making talents, with players such as Michael McGoldrick, Brian Finnegan (Flook), Jean-Michel Veillon, Sylvain Barou, etc, all using his world renowned "Rhiannon" bamboo flutes ! 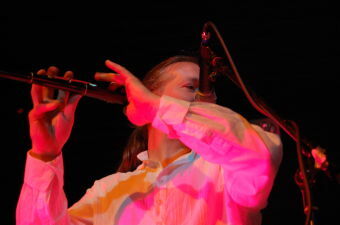 As you will see on stage, he is also one of the rare flute players who can play the flute using circular breathing, a technique which allows to play indefinitely without a break in the note!! Chris's previous band in the UK featured Jim Kravietski (bassist on Michael McGoldrick's first solo album 'Morning Rory') and Sylvan Richardson (from Simply red). Chris is also partner of the record company DBA productions, France. Since 1999, Chris has been touring with fantastic traditional harpist Frederic Bougouin-Kramer, who has an essential part on the album and on stage! Fred began his musical studies and apprenticeship of the Celtic harp at the conservatoire de Poitiers. He has worked with Janet Harbison, Katrien Delavier and Myrdhin (Afro-Celts). During the International Celtic Harp Festival of Dinan in Brittany, Fred was awarded 1st place for improvisation and 2nd place for composition. In 2006 he returned as a main artiste for the renowned 'Dinan harp festival' Fred is without doubt one of the most innovative traditional harpists of today!